pattern giveaway – mixed knits! the first of the december giveaways! i’m not sure why, but i’m always in the mood to give something away in december. the holidays? the weather? the knitting for family and friends? i’m not sure… but here’s the deal. to enter this giveaway, you need to respond to this post by showing me you or your family (or someone!) in some handknit woolies that you’ve made. 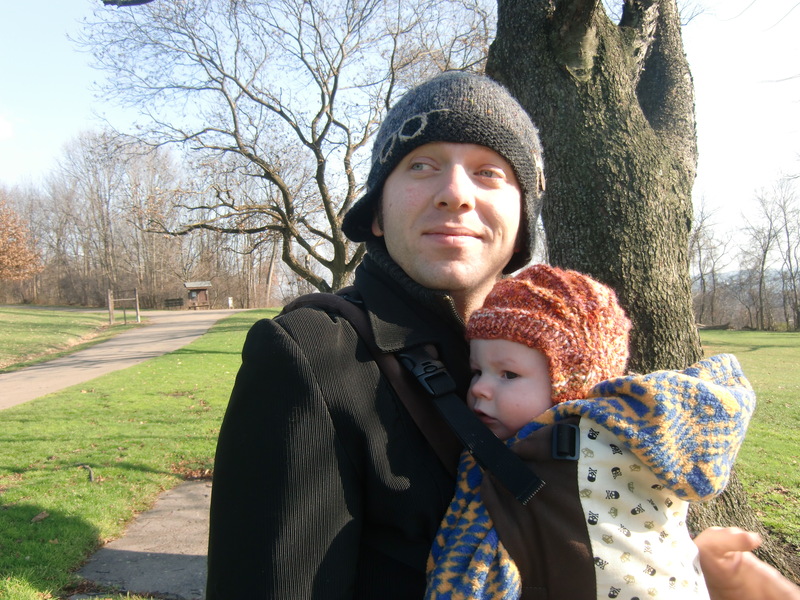 i’ve already shown you our family in knit hats, so i’ll kick things off with this pic of m and his papa. oh! and tell me about the knits. ben’s hat is this hat from my book and a couple of posts back you can read about the bean’s aviatrix, made from my handspun. 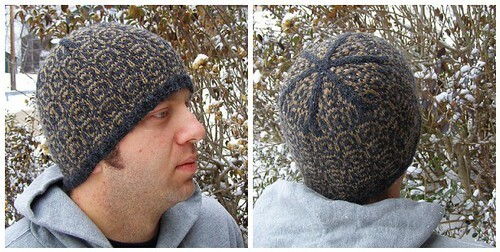 and 2 folks will win copies of the crossbow hat pattern. the version in the pictures was being worn by my brother-in-law last night when we talked to him on the phone. you have until friday at 8 pm eastern time to get your entries in. winners of each will be chosen by random number generator and announced on monday along with the next giveaway of the season. you’re allowed to re-gift the pattern immediately, if you so wish. 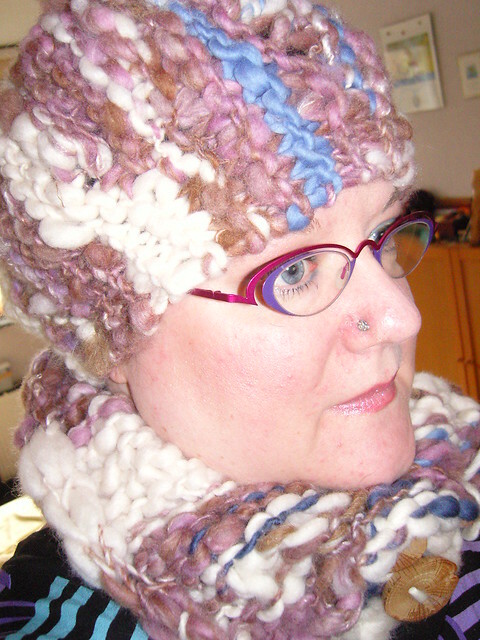 i can deliver pattern pdfs either by email or by ravelry. now then. let us see some of those fine woolens. 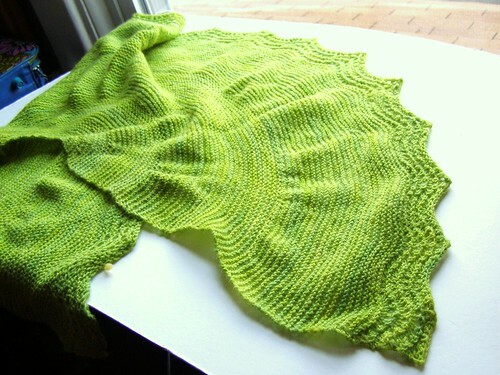 This entry was posted in community, cosyknitsliterally, free, knitting, patterns by cosymakes. Bookmark the permalink. My children end up with a lot of hats, as they don’t immediately outgrow those, and they get TONS of use in MN. They are good for at least one season! Thanks for the opportunity to win one of your wonderful patterns! HI there! First of all thank you so much for this giveaway, and Happy Holidays to you too! it is the lovely aviator cap by flor, and i love that it coves my ears and i can jam my hair under it. Hmm must track it down. My friend Sarah has cancer. I made this hat because while she hasn’t lost her hair, that doesn’t mean she doesn’t need an orange hat. Orange hats are a running joke between us. 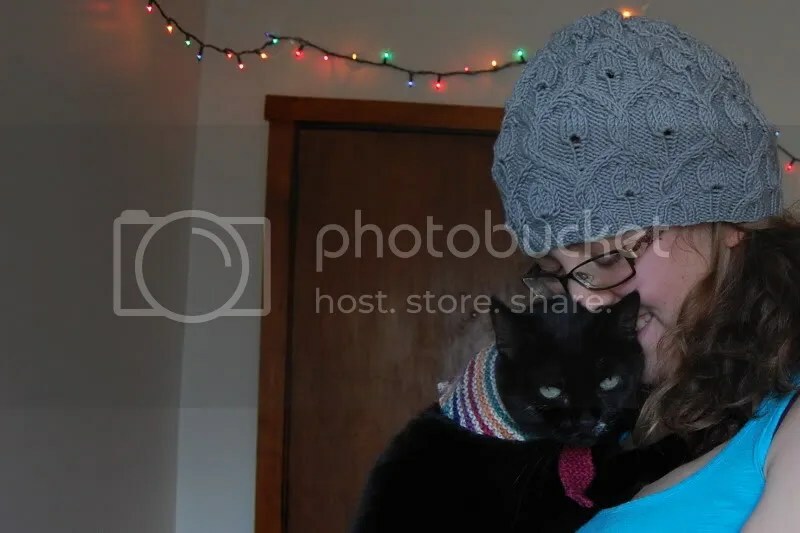 Here’s my two guys in sweaters I knit for them (scroll down a bit) — http://laurieg63.blogspot.com/2008/01/back-to-back.html. Both are wearing sweaters I designed. The one on the left is Irreversible, totally reversable front/back and inside/out. My older son who it was designed for says he hates it b/c he feels like his sweater is always on inside out and backwards. The other is an EZ seamless hybrid sweater. 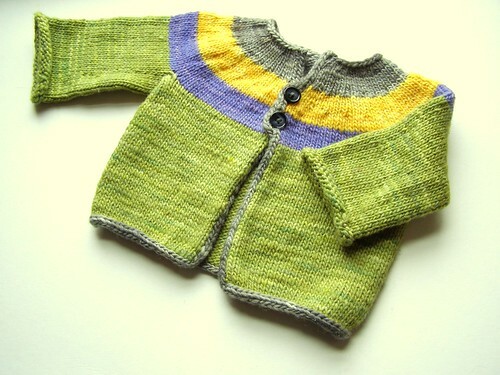 There wasn’t enough yarn for a whole sweater in one color, hence the different color sleeves/yoke. I think I like it, though. Here is my bug June in the hat I designed for her and her buddies. There is more info about her and the hat on that link. Knitting her and my older daughter are how I get through all that June has to live with. Happy Holidays! Here’s my good friend’s daughter in a hat (Daisy Helmet Hat, minus the daisy) made from your book. Is she adorable or what?! I love the way the hat ends up looking like kitty ears. Me wearing a sweater I made – just before I found actual sweater or scarf sticks – here I’m using a knitting needle (short doublepoint) to do the deed – at a holiday art fair in Bloomington, Indiana. 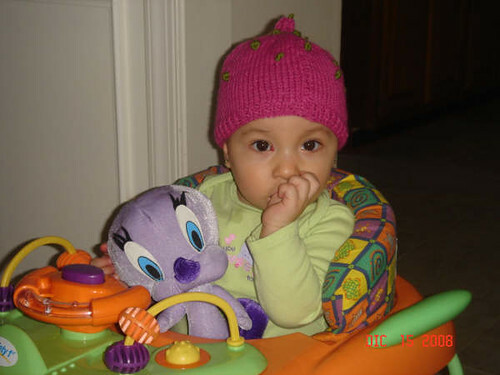 And my daughter in a hat that I made for her grandma– but it didn’t fit.